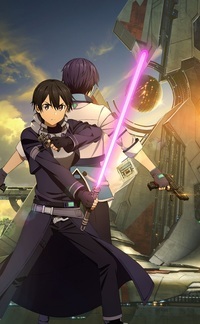 Bandai Namco has announced that Sword Art Online: Fatal Bullet will launch on February 23 in North America and Europe for PlayStation 4, Xbox One, and PC via Steam. 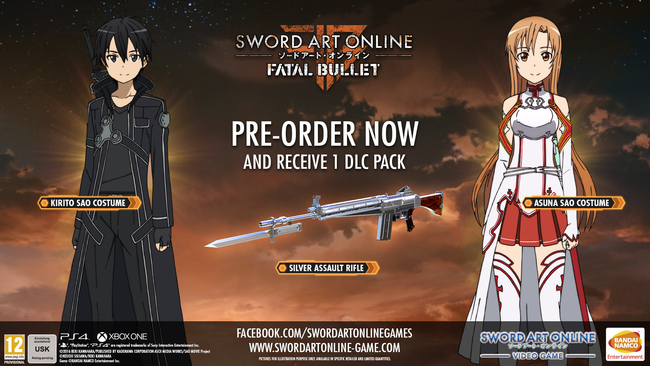 The publisher has posted a new trailer for this announcement, as well as details on pre-order bonuses and a Phantom Edition for the game. 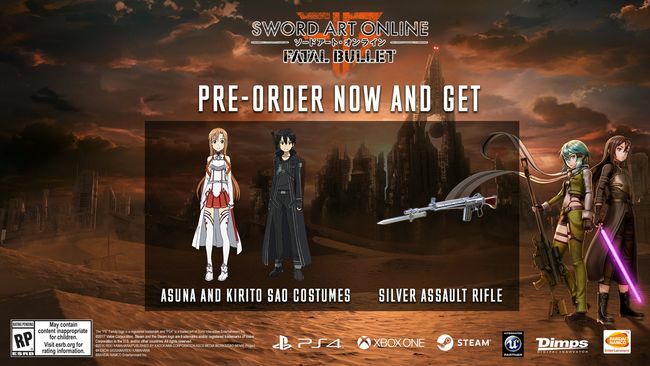 Those who purchase the game in North America or Europe will receive a unique Silver Assault Gun and Asuna and Kirito SAO avatar costumes in-game. A collector's edition for Sword Art Online: Fatal Bullet will also be available in North America and Europe, but there are some differences to note between regions. In North America, the Phantom Edition is limited to 1000 total units and is exclusive to Bandai Namco's online store for $99.95. It is available for the PS4 or XB1 versions. 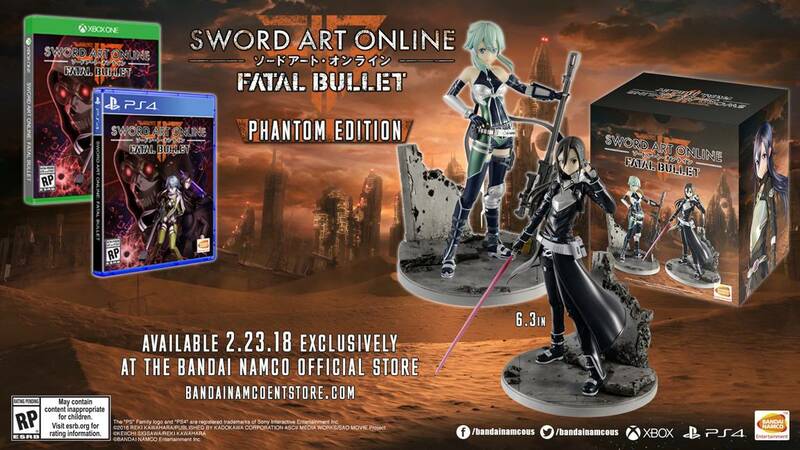 The Phantom Edition comes with 6.3" figurines of Sinon and Kirito dressed in costumes from the game. In Europe, a Collector's Edition will be available for both the PlayStation 4 and Xbox One versions. 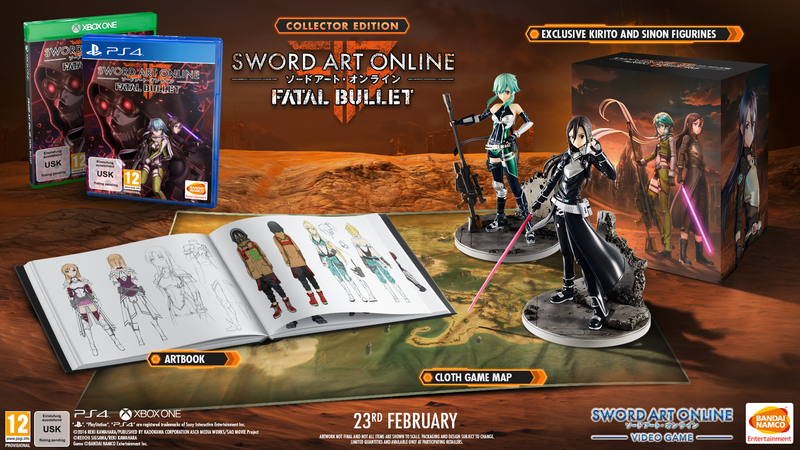 It also includes 6.3" figurines of Sinon and Kirito, as well as a cloth Game Map and an art book. Pricing and availability have yet to be announced. Collector Edition: Features the full Sword Art Online: Fatal Bullet Game, Kirito and Sinon figurines dressed with exclusive costumes from the game, 1 cloth Game Map and 1 exclusive art book. You can find information about recently revealed characters and the Ultimate Fiber Gun here.